It starts off gently. A little bet here. A larger risk there. Dentists do it. Lawyers do it. Bankers do it. Even the odd bureaucrat too. Lending it a veneer of respectability. Pretty soon the user who knows no better is hooked on it : short selling. I'm not saying in makes you dip into Granny's purse for a fix. Not at first anyway. I'm not saying it makes you a (completely) Bad Person. But it is the thin edge of the proverbial. For the next step is entry into the shadowy, coded, jargon filled world of options. This is harder stuff, now - gamma, theta, vega, delta. Straddles, butterflies and generally going naked short all over the shop in an alarming variety of degenerative, vulgar positions. Unwholesome stuff. And it feeds the need. Before one realises that the flight out the door on the wing of serious leverage was ever made assets are 150 times equity and an entire portfolio of unbacked credit default swaps have been hidden from sight in some Vanuatu-registered offshore public lavatory. No point fighting it at this stage. Might as well retire directly to the Shady Pines "Active Hedging Strategies" rest home populated by (amongst so many unfortunates) the spirits of Metallgesellschaft and, of late, Lehman Brothers. 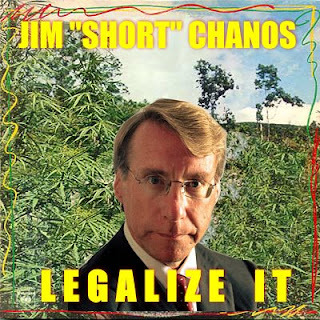 So don't be fooled by the charm, wit and logic of short pushers like Mr James Chanos (some shorters' campaign material is below for easy id) and his recent oh-so-clever Wall Street Journal guest editorial. Write this instant with serious pen and ignorant ink to your political representative to demand that this repugnant, degenerative habit - which can also cause blindness, let's not forget - be banished from our financial system. And also to ask for cash to pay the mortgage. NB: Mr Chanos is not quite as at home as Peter Tosh in this shot. For the avoidance of doubt that is because Mr Chanos does not to my knowledge promote the cultivation or smoking of any vegetation where such acts contravene law. So don't sue me. What's more, neither the gardening nor the recent smoking habits of the SEC, FSA and their equivalents across the short-banned equity market world are known to me. When a short seller must locate actual shares to borrow, pay for the use of someone elses property, and face a margin call, then it's legit. It provides liquidity and helps in price discovery. Naked short selling on the other hand is fraud and should be prosecuted. The two are NOT the same. V true. And naked shorting is already illegal but poorly enforced. This ban is not about going naked; it's about scapegoats.